On the coast of 1850s Maryland, the escape of the "Dreamer," a female slave who has mysterious visions of the future, has repercussions throughout the region, as she is pursued or given refuge. Based on actual events, this tremendously engrossing novel features conflicted slave catchers and plantation owners, ruthless slave stealers, and the population of slaves themselves, who employ a secret code of visual clues, in order to aid their fleeing brethren. Part gripping, old-western tale, part complex morality play, and completely heartwrenching in its authenticity, this book enlightens as it is enthralls, deserving recognition as a classic of American historical fiction. In the days before the Civil War, a runaway slave named Liz Spocott breaks free from her captors and escapes into the labyrinthine swamps of Maryland’s eastern shore, setting loose a drama of violence and hope among slave catchers, plantation owners, watermen, runaway slaves, and free blacks. Liz is near death, wracked by disturbing visions of the future, and armed with “the Code,” a fiercely guarded cryptic means of communication for slaves on the run. Liz’s flight and her dreams of tomorrow will thrust all those near her toward a mysterious, redemptive fate. 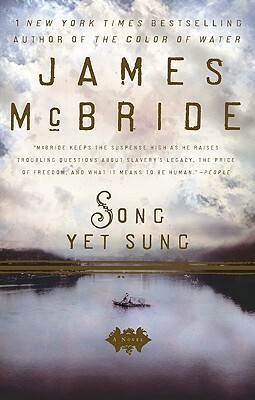 Filled with rich, true details—much of the story is drawn from historical events—and told in McBride’s signature lyrical style, Song Yet Sung is a story of tragic triumph, violent decisions, and unexpected kindness. Awarded a National Humanities Medal by President Obama, James McBride is an accomplished musician and author of the National Book Award-winning The Good Lord Bird, the #1 bestselling American classic The Color of Water, and the bestsellers Song Yet Sung and Miracle at St. Anna, which was turned into a film by Spike Lee. He is also the author of Kill 'Em and Leave, a James Brown biography. McBride is a Distinguished Writer in Residence at New York University.